What should you look for when getting your blood tested? A blood test can tell you a lot about your health. In fact, nearly two-thirds of the data for accurate diagnosis and health management is in your blood, and this data is important not only for treating disease, but for overall health and wellness. So which blood tests are critical for you to take? We gathered the evidence here to help you plan for your doctor visits in the coming year. Though we’re talking about a number of lab tests here, these can all be done off one simple blood draw. In other words, you need take only one actual blood test, and then just ask the doctor to be sure the laboratory technicians check the following levels. Lipids: These are the fats in your body. Measuring the lipids in your blood tells you cholesterol and triglyceride levels, which both have an impact on the health of your heart. You need to fast before this test for about twelve hours. Results total cholesterol: Low risk: < 200 mg/dL. (Desirable is 150 or less.) Borderline high: 200-239 mg/dL. High: >240 mg/dL. Results LDL “bad” cholesterol: Low risk: < 100 mg/dL. (Optimal is < 79.) Near optimal: 100-129 mg/dL. Borderline high: 130-159 mg/dL. High: 160-189 mg/dL. Very high: > 190 mg/dL. Results HDL cholesterol: Poor: < 40 mg/dL (men), < 50 mg/dL (women). Better: 50-59 mg/dL. Best: 60 mg/dL and above. Results triglycerides: Desirable: < 100 mg/dL. (Optimal is < 50.) Borderline high: 150-199 mg/dL. High: 200-499 mg/dL. Very high: > 500 mg/dL. C-reactive protein (CRP): This is a measure of the inflammation in your body. Recent studies have found that inflammation is key to the progression of many diseases, including coronary artery disease, infection, inflammatory arthritis, lupus, and pelvic inflammatory disease. The test won’t tell you what’s causing the inflammation—only reveal the presence of inflammation in the body.Results: Low risk: < 1.0 mg/L. Average risk: 1.0–3.0 mg/L. High risk: > 3.0 mg/L. Fibrinogen: This is an important contributor to blood clotting, but if levels are high, it can indicate inflammation. High levels can also point to potential heart disease, rheumatoid arthritis, and kidney inflammation. Results: Normal: 193-423 mg/dL. Optimal: 295-369 mg/dL. Comprehensive metabolic panel (CMP): This measures the status of your kidneys, liver and ecotrolyte and acid/base balance, as well as all of your blood sugar and blood proteins. It’s a quick snapshot of your body’s chemical balance and metabolism. Results show levels of your sodium, potassium, calcium, chloride, carbon dioxide, glucose, blood urea nitrogen, creatinine, protein, albumin, bilirubin, and liver enzymes. Normal results: Normal levels are as follows. Albumin: 3.9-5.0 g/dL. Alkaline phosphatase: 44-147 IU/L. ALT: 8-37 IU/L. AST: 10-34 IU/L. BUN (blood urea nitrogen): 7-20 mg/dL. Calcium: 8.5-10.9 mg/dL. Chloride: 96-106 mmol/L. CO2: 20-29 mmol/L. Creatinine: 0.8-1.4 mg/dL. Glucose: 100 mg/dL. Potassium: 3.7-5.2 mEq/L. Sodium: 136-144 mEq/L. Bilirubin: 0.2-1.9 mg/dL. Protein: 6.3-7.9 g/dL. Complete blood cell count (CBC): This measures your concentration of white blood cells, red blood cells, and platelets in the blood. 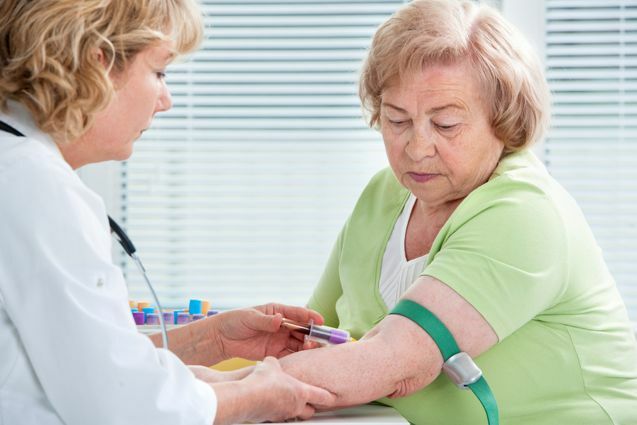 This helps the doctor check for things like anemia, infection, and other potential health problems behind symptoms like fatigue, weakness, and bruising. It can also indicate the presence of blood cancers. Normal results: Red blood cells: 4.32-5.72 trillion cells/L (men), 3.90-5.03 trillion cells/L (women). Hemoglobin: 13.5-17.5 grams/dL (men), 12.0-15.5 grams/dL (women). Hematocrit: 38.8-50.0 percent (men), 34.9-44.5 percent (women). White blood cells: 3.5-10.5 billion cells/L. Platelets: 150-450 billion/L. Thyroid stimulating hormone (TSH): This is the test that checks the function of your thyroid, and how well it’s doing at producing hormones. The results can help a doctor diagnose hypothyroidism (where the thyroid is underperforming), which can cause symptoms like weight gain, fatigue, constipation, and hair loss. It can also illuminate hyperthyroidism (where the thyroid produces too much thyroid hormone), which can cause heart and bone problems. Normal levels: 0.4-4.0 mlU/L. Desirable: 3.5 mlU/L or less. Hemoglobin A1C: This test is used to diagnose type 1 and type 2 diabetes, or to gauge how we’ll you’re managing your disease. It shows your average blood sugar level for the past two to three months. More specifically, it measures what percentage of your hemoglobin (the protein in red blood cells that carries oxygen) is coated with sugar. The higher your A1C level, the higher your risk of diabetes. Results: Normal: 4.8-5.6 percent. Prediabetes: 5.7-6.4 percent. Diabetes: > 6.4 percent. Homocysteine: This test measures the level of the amino acid homocysteine in the blood. It helps identify deficiencies in vitamin B12 or folic acid. High levels can indicate risk for heart disease, stroke, and kidney disease. Results: Best: < 7.0 umol/L. (Optimal is < 6.0.) Normal: 4.3-15.3 umol/L (men), 3.3-11.6 umol/L (women). For more detailed information on blood testing and to find out what diet, supplements, and lifestyle changes are right for you, see our Blood Test Blueprint. Have you taken these blood tests? Did you discover health problems as a result? Please share your story. ← Science Confirms Turmeric As Effective As 14 Drugs!